One of my fondest memories from college is raiding the lunch box of one of my classmates whose mom made the most delirium inducing Uttapam Pizza. She always had to pack a few extra, because the hostel dwelling gluttons would otherwise not leave enough for her. I thought that was THE coolest thing, ever! The truth is, your average homemaker has been experimenting with different cuisines in the lesser known kitchens for ever now. The Indian Chinese which is now so common is just one example of this. Culinary twists have been pretty mainstream in ordinary households for a while now. And with exposure to new ingredients, they are now finding a new voice, and many new flavours. I remember a staple snack of Maggi bhelpuri, and motichoor laddu mousse, which later became famous through food magazines and some enterprising chefs. But there are so many others that remain to be explored and rediscovered. 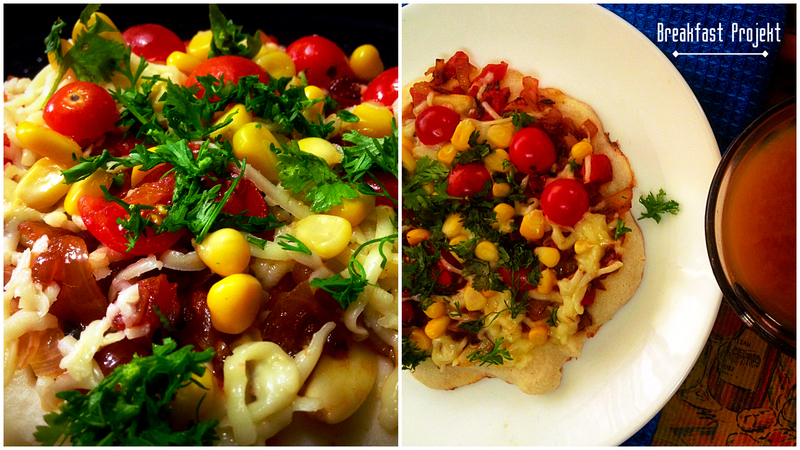 I like to keep things unpredictable in my own kitchen so obviously, a lot of these experiments happen regularly. One of them, predictably, is the Uttapam Pizza I craved so intensely in my college days. 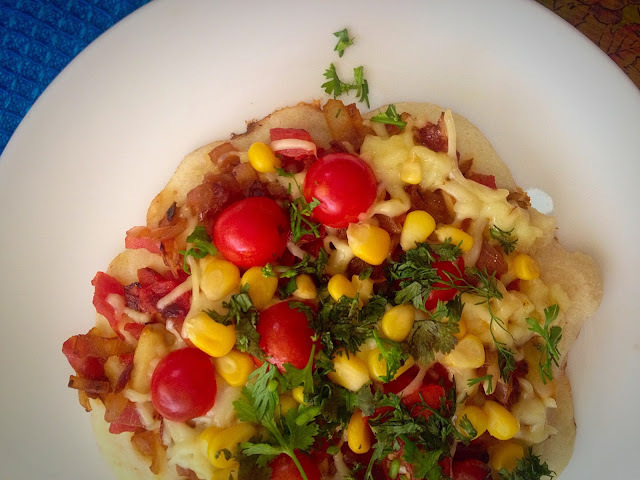 I took me a long time before I came around to experimenting in my own kitchen for a variant of that much loved Uttapam Pizza. A bit of trial and error happened. You see, nostalgia is a tricky thing. I was trying to recreate something from over a decade ago. While I could not create the exact taste that my memory has held on to so strongly, I did manage a great tasting version that Mr Khan and I love. Give this a try, and of course, create your own variant. This is a beginner level, simple recipe, and can be made in a really short time, making it perfect for breakfast. As I have stated before, and will repeat many times later, cooking need not be a mundane, boring, daunting task ever. It’s all a matter of knowing the right tricks to create fabulous meals that balance taste and nutrition. 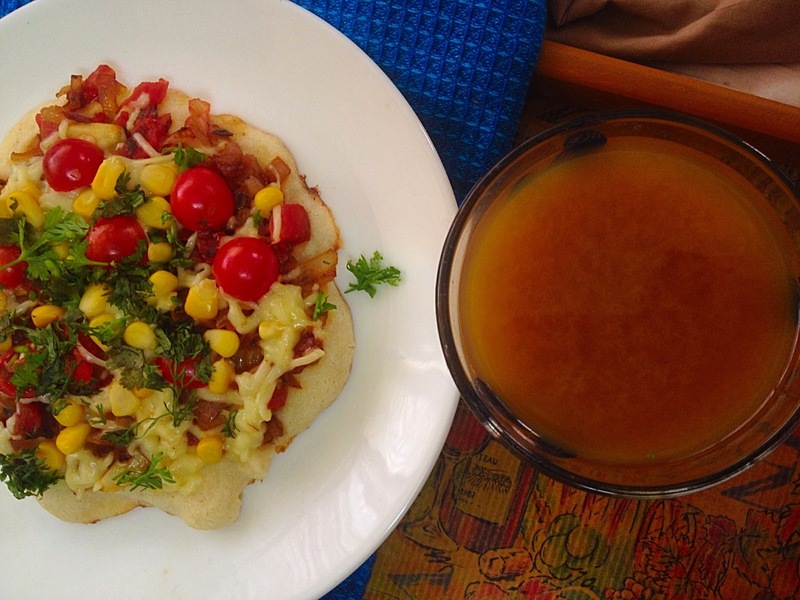 While I suggest that the Uttapam be served immediately, it can actually be packed off as a mid-day snack, or even a light office lunch. Sauté the garlic and chopped onions till browned. Add the tomatoes, and salt. Cover and cook till the tomatoes are cooked. 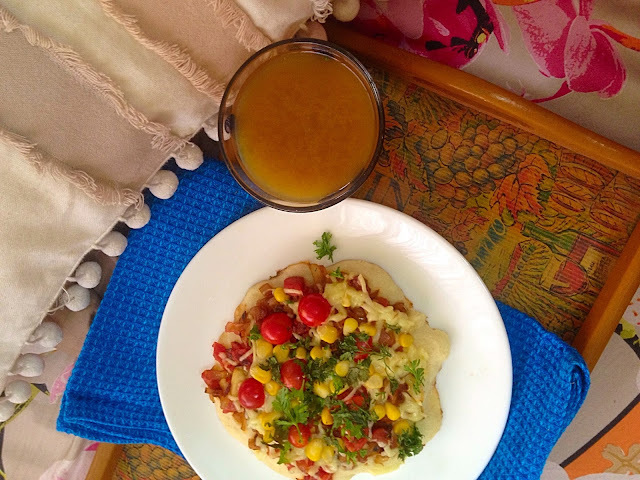 Heat a non-stick pan and pour half the batter to make uttapam. When it’s beginning to be cooked, and the sides come off easily, spread half the cooked tomatoes and onion over the Uttapam. 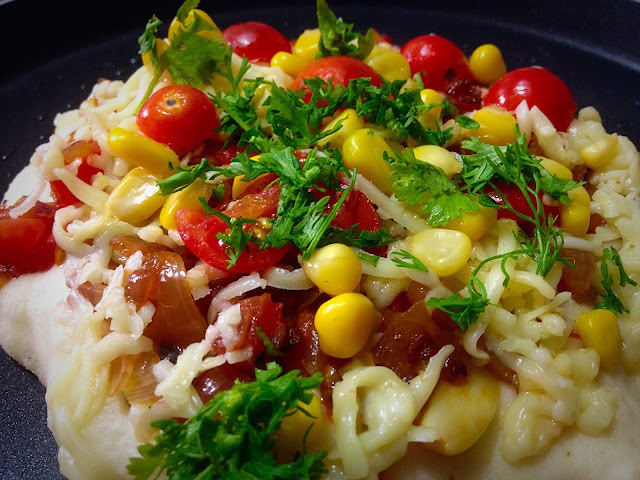 Spread half the grated cheese, and sprinkle ¼ cup boiled sweet corn over the cheese. Top with the cherry tomatoes/olives, and some chopped coriander. Cover and cook on low flame for 3-4 minutes, or till the cheese melts.